Why are Silver Eagle Coins so Expensive? The 1 oz American Silver Eagle Coin is and has been the most popular silver bullion product sold in the physical investment grade silver bullion industry for many decades now. Above is an example of how the front or obverse of this classic silver bullion coin looks since launching in 1986. Of course silver price history is much longer than the brief thirty-three years these most popular silver bullion products have been around. Who makes Silver Eagle Coins? 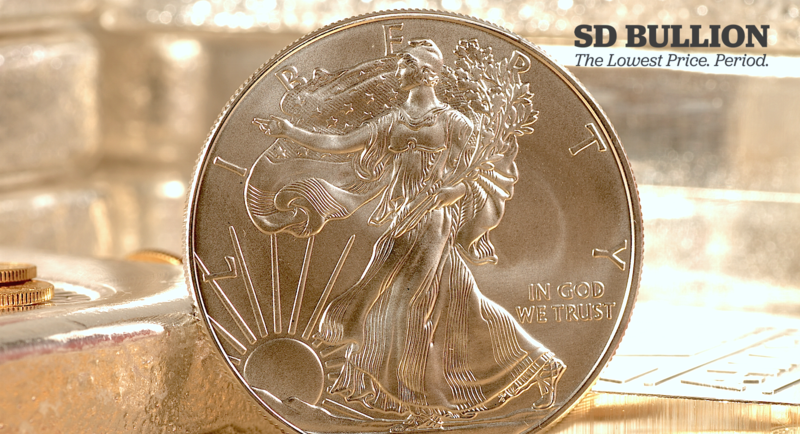 The US Mint has made 1 oz American Silver Eagle Coins since 1986. You can find all the various year's American Silver Eagle mintages further below. You can also take a quick tour of the US Mint’s Silver Eagle Coin operation in the following US Mint Tour video. Often retail priced new around $2.50 oz USD to often time many more US dollars over the fluctuating silver spot price (depending on silver bullion market conditions), the 1 oz American Silver Eagle coin is often the most expensive of all the high volume minted and sold government guaranteed silver bullion coins being sold in the world. In this article, we explain a few reasons behind why Silver Eagle Coins are so expensive compared to other high-mintage government issued silver bullion coins. You can learn more about the recent history of US Mint Silver Eagle Price increases for from the fall of 2008 through 2010. Moving from $1.25 to today's $2 oz USD over spot charge to silver dealer networks for newly issued coins. The following is a brief definition of what seigniorage fees mean in the government mint issued silver bullion coin market. Silver Coin Seigniorage Fee - (n) an additional premium over the fluctuating silver spot price charged by a government mint that issues silver bullion coins. The difference between the melt value of silver coins (essentially the spot price) and the government mint’s production costs and profits to be attained by selling their silver coins. Silver Eagle Coin Value Inputs: What affects Silver Eagle Coin prices? The fluctuating silver spot price is the representative price for silver exchanged on global commodity futures exchanges. Since we here at SD Bullion are in the USA we quote our prices in US dollars, yet there are silver spot prices in virtually any and all fiat currencies issued globally. A silver coin seigniorage fee is charged by government mints who produce government guaranteed physical silver bullion coins. This surcharge helps government silver mints recoup their silver coin production costs and perhaps make a profit as well. Silver bullion coin dealer supply chains also add a premium to their silver coin prices to recoup the costs associated with buying, inventorying, hedging, marketing, selling, and safely shipping purchased silver coins to their respective buyers. Did you know about the history of Silver Eagle Coin Prices? There have been times when the US Mint has sold out, postponed, or rationed Silver Eagle Coin sales and allocations. 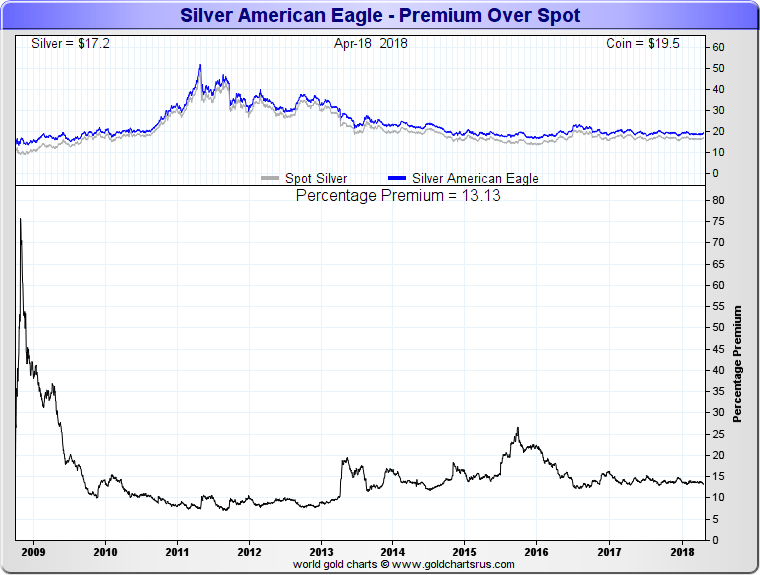 The largest price premiums for 1 oz American Silver Eagle Coins was reached during the 2008 Financial Crisis in which Silver Eagle Coins sold as much as 75% over the then fluctuating silver spot price. The following screenshot is from a now-defunct bullion dealer, who for years sold multi-$100s of millions of US dollar values in high-volume low priced allotments of bullion. On November 4, 2008, any remaining available 1 oz American Silver Eagle coins were selling at +65.8% price premium above the then US dollar silver spot price ($9.86 oz). ➤ The current Silver Eagle Coin market supply and demand factors. ➤ The volume of Silver Eagle Coins being purchased or sold. ➤ Global, national, and even local economic conditions. ➤ The quality of Silver Eagle Coin being sold (e.g. brand new, secondary market, or sometimes even damaged cull condition). ➤ The Silver Eagle Coin seller’s objectives: whether or not they are a low cost, high volume dealer or potentially a more pricey higher overhead local silver coin seller. Certain key dates for 1 oz American Silver Eagle coins have much smaller mintages than other years. For instance, most years following the 2008 global financial crisis had record mintage volumes of American Silver Eagle coins struck and sold to the investing public. They are again, the most popular silver bullion product by capital flows and purchase amounts, year after year, and by a large margin. Below we have highlighted some of the lowest mintage years for Silver Eagle Coins with the mintage in 1996 being the rarest year of issuance, with less than four million struck and sold globally. MINTAGE NOTE: just because a bullion dealer is selling older Silver Eagle Coins at high price premiums does not necessarily mean they are buying them at or near their inflated retail prices. If you simply get a bid price for these more limited ASE mintage coins, you will likely find the spreads (difference between buy and sell prices) to be much wider than newer higher year mintages. 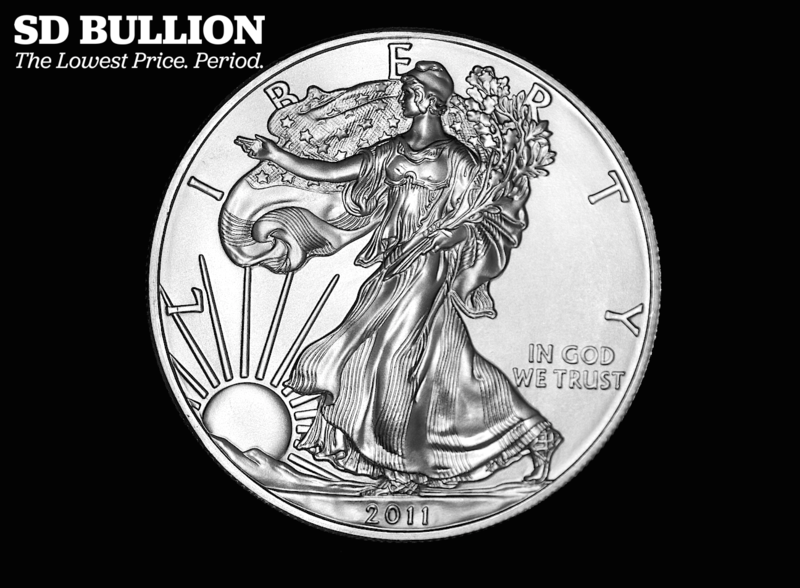 Bulk silver bullion buyers often buy their 1 oz American Silver Eagle Coins in bulk quantities of 500 oz. 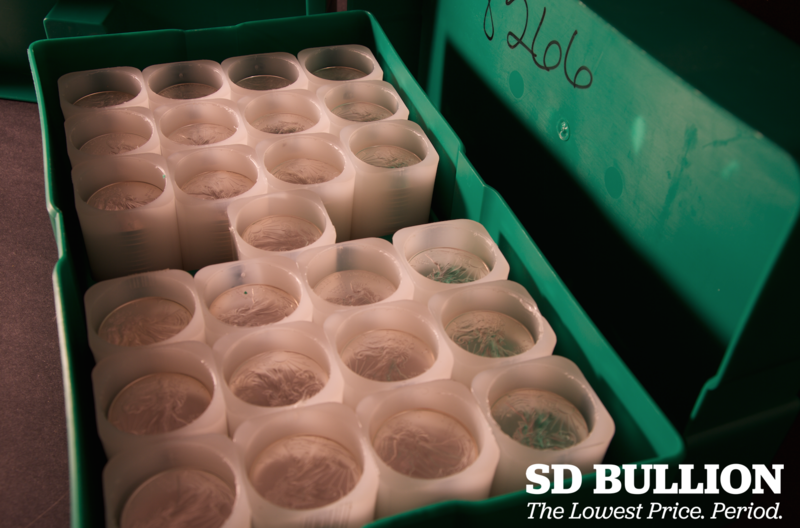 Such volumes of 1 oz American Silver Eagles coins come in protective official US Mint cases and mint tubes (containing 20 pieces in each tube, with 25 tubes in each case nicknamed a 'monster box' due to their heavy 35-pound weight overall). Bottom line is that 1 oz American Silver Eagle coins (ASEs) are still the most highly purchased and sold high-mintage silver bullion product in the world. The fact that ASE premiums tend to increase the most during bullion shortages potentially allows some interesting arbitrage opportunities for American Silver Eagle coin holders during bullion shortage episodes. For instance during high demand low supply timeframes, one could sell ASEs and immediately buy lower premium silver bullion products if available during demand spikes (e.g. sell ASEs and buy large silver bullion bars or rounds with the proceeds, in order to increase overall silver bullion ounces owned). You can learn more about American Silver Eagle Coins, precious metals and bullion by visiting our 21st Century Gold Rush page and downloading our free PDF eBook available for free there.